What better way to celebrate Father's Day (Sunday, June 17th) than a good old lightsaber fight? 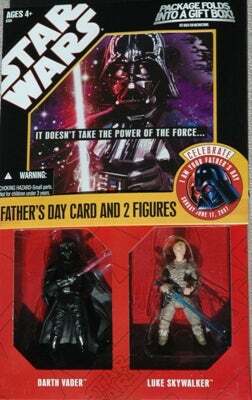 Here's the next best thing, a Hasbro Star Wars Father's Day card with figurines of Darth Vader and Luke Skywalker. To make things easier for you, the package even folds into a gift box, eliminating that tedious wrapping chore. And maybe old Dad isn't worth the work of wrapping up a present, either. Could that be why you'd want to give him a little gift set illustrating a classic father/son problem? We're both good, Dad, it's just a joke. Really. But be careful about messages you send with gifts. For example, you don't want to give a bottle of mouthwash as a Father's Day gift. So dear reader, who's the evil one? You or your dad? Both? Neither? Discuss.